Our ranch wasn’t the same without Samson. For several days I walked all over our property and rode the length of the canyon, calling his name and looking everywhere, all to no avail. Certainly, our faithful Dane hadn’t run away. Sam had always been good about staying close to home and wasn’t prone to wandering off like Harley used to (had Harley been neutered we wouldn’t have had that problem, but my dad believed neutering “ruined” a dog). It just wasn’t like him to take off, and coupled with his strange behavior over the past few weeks I knew something was wrong. Still, I hoped that somehow Sammy would find his way back to us and all would be well with the world again. About a week later Temptor and I were coming home from an afternoon trail ride, the light turning golden as the sun headed toward the eastern horizon. Although I always loved our quiet excursions in the mountains, our rides weren’t the same without Sammy, and I think even Temptor missed him, too. That day I had decided to take a different path home and enter from the front of our ranch, up alongside our property line to a small gap in the fence at the top of a hill, where I wouldn’t have to dismount and unlock any gates. But as we were trotting past a large clump of Sumac bushes a foul smell hit me. Suspecting what it was but hoping I was wrong, I pushed Temptor into a canter and rushed him back to the stable, where I quickly dismounted and tied him in a stall. He protested a bit, as he didn’t understand why I was straying from our usual post-ride routine, but I knew I needed to get back to those bushes and find the source of that odor, and as soon as possible. As I ran through the front paddock, climbed through the fence and approached the giant Sumac I was once again hit with the strong stench of rotting flesh. The bushes were so thick I had to pull and push my way inside, which I hated doing, as ticks like to hang out in Sumac leaves. But I pushed forward, and as I did the smell grew stronger. And that’s when I saw Sam, lying in a small clearing at the base of the bushes. I didn’t have a clear view, as I would have needed to crawl on my belly to get much closer, but as I crouched down and peered through the branches, I caught sight of that distinctive blue merle coat, those floppy ears, the black leather collar and silver tag. As I stared harder I noticed Sam’s skin appeared to be moving – maggots were making quick work of what was left of him. Tears welled up in my eyes. There was no point in trying to get closer or move him – the overgrown Sumac bushes were to be his final resting place. So I went home and told my parents and my sister, who cried inconsolably, as she’d always loved her “Whammy.” Our Sam, our best ranch dog, was gone. He hadn’t run away, he had run off to die by himself. 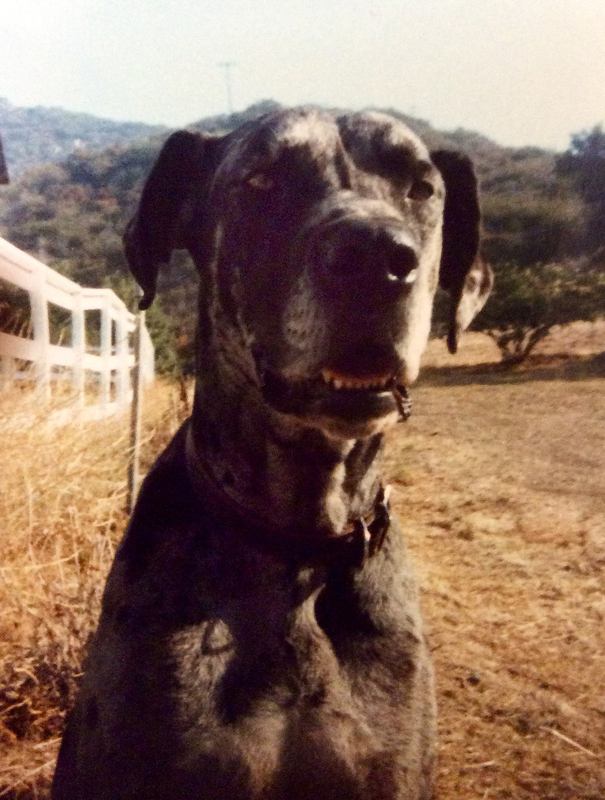 We thought he had simply passed away of old age, another Great Dane gone before his eighth birthday. It wasn’t until many years later when I briefly worked as a veterinary technician in my late 20s and learned how canine periodontal disease can lead to heart disease, that I realized what had actually happened to Samson. Bacteria from the infection in his mouth had most likely traveled to his heart and caused endocarditis, or inflammation of the heart valves, which led to inevitable heart failure. And while large, big-chested breeds like Danes can be prone to heart disease, what had happened to Sam could most likely have been prevented through basic dental and veterinary care. Yes, he had already been old for a Dane and may have only had another year or two left, but at least we could have made sure he died painlessly and peacefully rather than sick, weak and alone under a Sumac bush. Realizing all of this was a “live and learn” moment for me, but one that came at a big price. I became wracked with guilt, believing I was responsible for Sammy’s unnecessary suffering and untimely demise. I had seen the state of his mouth, and yet I had said and done nothing. For years I would punish myself whenever I thought about Sam, dwelling on how much he’d suffered and feeling like a terrible person who had neglected and abused her dog. It probably wasn’t productive to beat myself up about it over and over, but it served as a huge lesson I will never forget. My thoughts began to turn to the other animals that had come and gone in my life, some before and after Sam, creatures I thought I’d cared for to the best of my abilities. Yet when I thought about how they’d lived and died, I wondered if I hadn’t let them down, too. I had never hurt any of them intentionally, but like Sam, there were some who had probably suffered due to my ignorance, selfishness and indifference. I began to doubt myself, picturing all of those sweet faces and thinking back on how I had treated them, some better than others. Thus began a shifting of my consciousness, one that took many years and a lot of self-examination. But ultimately, it took a very special teacher to help me evolve from a pet owner to a true pet parent. Everything changed when a German shepherd named Max came into my life. He belonged to a man who later became my husband (and ex-husband nine years later) and was one of the most regal, intelligent and loyal dogs I had ever met. I had always admired GSDs – their intellectual capacities, their beauty, their fierce devotion to their families – but had never had much contact with them, and in a sense, Max was my baptism to the breed. Sort of a baptism by fire. Max was wonderful but he had some serious faults. He was extremely fear aggressive toward other dogs, and very wary of strange people (he would actually try to bite them if they weren’t introduced “correctly.”) Mike had raised Max from a six-week-old pup and adored the dog but he had made a series of socialization and training mistakes that resulted in Max’s chronic behavioral problems. Consequently, being out in public was never a fun time with Max, so Mike simply avoided taking the dog anywhere where there would be people or other canines. But despite those great inconveniences, Mike was the most dedicated dog owner I’d ever seen, always going out of his way to meet Max’s needs, keep him happy and out of trouble. I had never lived in an apartment (or inside any dwelling, for that matter) with a dog before, and when I would get annoyed that Max was always in my face or irritated with how he limited our social life, Mike would remind me that while Max had his faults, he was our responsibility and we were his pack. Max was “a person” who had feelings, and his feelings mattered. Through Max, I learned how to truly understand, care for and love dogs as I never had before. I’d always thought of myself as an animal lover, yet I came to realize there was a big difference between someone who “owns” a pet and someone who “parents” one. While Max definitely tested my patience, especially when he’d freak out trying to get at another dog when we were out on a walk, when we’d come home from long hours waiting tables to find diarrhea all over the carpet, or when we couldn’t have people over because he couldn’t be trusted – indeed that was not endearing. But as time passed and I learned to have empathy for Max, I slowly became more patient, tolerant, and compassionate. Learning to appreciate and understand Max opened my heart in a way it had never been before, and when we brought Hugo, a gorgeous little GSD puppy, into our lives a few years later, my heart simply swelled with love. I became a Mommy, plain and simple. But all these years later I admit I am sometimes haunted by the animals of my past. Perhaps it’s not uncommon for people who’ve had animals all their lives to feel sadness and shame for how they may or may not have treated their pets, especially if those people had to go through a long learning curve like I did. When my thoughts return to Sam I am still prone to pangs of regret, wishing I could have saved the loyal Dane who needlessly suffered as a result of my ignorance. Figuring I could use some professional advice, I talked to Susan Lovell, Ph.D, a psychologist who runs a private practice counseling adults and couples in Santa Monica, California (full disclosure: my aunt). She told me there are two kinds of guilt – persecutory guilt, which is a neurotic state of mind in which people have an overwhelming sense of guilt for situations they’re not actually responsible for, and reparative guilt, in which a person feels remorseful and regretful about an action that hurt or injured someone else and wants to take action to make amends (perhaps something as simple as saying, “I’m sorry”). What I needed to do, she recommended, was move from the former to the latter. And so I have made the decision to do just that. While I will always feel badly about Sam, I cannot change the past, I can only learn from the mistakes I made and allow him and all the other animals who have walked through my life to leave their indelible paw prints on my heart. Animals don’t live in the past and neither should I. Instead, I will let their memories inspire me to not only be a better caretaker and dog mom, but also a better human being. I now embrace the belief that animals are not less-intelligent creatures that exist for our pleasure or to suit our purposes, but are sentient beings who feel emotions, form attachments, experience pain and deserve respect and protection. Today, my three dogs definitely benefit from what I have learned and who I have become. While I’m far from perfect (sometimes I still get impatient and raise my voice when they do something really aggravating), I consider them my children who deserve all the love, care and consideration I can possibly give them. I go out of my way to meet their physical, emotional and mental needs, and when I can prevent or stop their pain or suffering, I do it without hesitation. I will never let what happened to Sam happen to them. While I will always wish I could have been a better guardian of the animals of my past, all I can do now is keep growing, continue learning, do my best and give back. I have become a voice for the voiceless and know without a doubt that making the world a safer, more compassionate place for animals is indeed my true calling in life. I think Samson would appreciate that. This entry was tagged pet parenting. Bookmark the permalink. Your story strikes a chord. Mine is not the same story, but I have also felt regret that what I know now, I wish I’d known in the past. The regrets will always be a part of me, but I feel that my dogs loved me and forgave me, and maybe are happy that I’ve learned so much because of them. Your word, Evolution, is exactly right. I have evolved. I am a ‘dog Mom’ and when my newest rescue, a Staffie/Boxer mix, settles down some, I truly hope to become a ‘Foster Mom’, too.